Your personal data – what is it? Personal data relates to a living individual who can be identified from that data. Identification can be by the information alone or in conjunction with any other information in the data controller’s possession or likely to come into such possession. The ‘processing’ (i.e. using) of personal data is governed by the General Data Protection Regulation (the GDPR) which comes into force on 25th May 2018.
Who are we? The Board of Trustees of Music at St John’s (“We”) are the data controllers (contact details below) and decide how your personal data is used and for what purposes. How do we use your personal data? Music at St John’s complies with the obligations under the GDPR by keeping personal data (such as names and contact details) up to date; by storing and destroying it securely; by not collecting or retaining excessive amounts of data; by protecting personal data from loss, misuse, unauthorised access and disclosure and by ensuring that appropriate technical measures are in place to protect personal data. 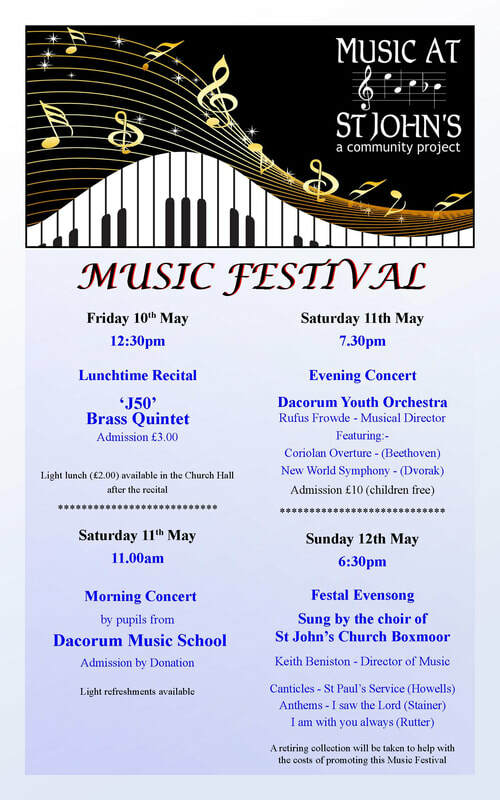 Inform you of news, activities and events of a musical nature within the local community of Boxmoor. Fundraise and promote the musical interests of the community. What is the legal basis for processing your personal data? Data is processed under Article 9 of the GDPR which allows processing to be carried out by a not-for-profit body. Processing relates only to members or former members (or those who have contact with it in connection with those purposes) and there is no disclosure to a third party without consent. We will seek explicit consent from you so that we can keep you informed about news, events, activities and services. See accompanying Consent form. Sharing your personal data Your personal data will be treated as strictly confidential and will only be shared within the charity to enable us to provide details of musical events to you. How long do we keep your personal data? We keep data for no longer than is reasonably necessary. Further processing If we wish to use your personal data for a new purpose, not covered by this Data Protection Notice, then we will provide you with a new notice explaining this new use prior to commencing the processing and setting out the relevant purposes and processing conditions. Where and whenever necessary, we will seek your prior consent to the new use.